I'm a planner. It's part of what I most love about beginning any project. Mapping it out, figuring out what needs to happen. This is where I'm in my glory. Dreaming, imagining possibilities, figuring out new ways to do things. My usual pattern is to get stuck right here. In the dreaming and collecting of ideas. After I spend scads of time planning, I tend to spend an equal amount of time and energy ripping the ideas apart for various reasons, most of which boil down to fear of moving forward. This is a pattern that has come up in my painting too, and we've stared each other down. The place I resist in my life and in my painting is in getting started. What I'm realizing and seeing very clearly in creating is that once I begin, I couldn't be happier. I just need to push past the resistance. Painting is showing me the rewards of going forward instead of turning back in defeat, pen in hand, waiting to scribe the next BIG IDEA. So here we are. If I'm going to be a thriving artist, I have to keep moving. I'm starting with a mind map. A visual depiction of my plans. I love this format because it's non-linear. It's an all-over the place free flow of ideas with one idea leading to the next. It has questions, it has potential answers, and then more questions. But, it's a map. A guide. Something to return to when the voices of doubt begin their clamour and I think I should turn back. It's really easy to do. You start with your idea in the middle. You can see here that mine is "Thriving Artist". You can do this with anything. A dream that you have, how to redecorate your living room, your grocery list. It doesn't have to be fancy or have paint on it. I just do that because it's an excuse to paint. 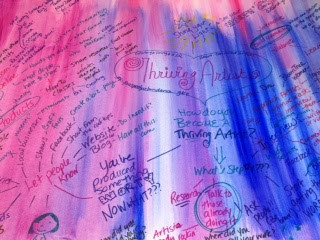 From the center, I begin to branch out and ask questions like, How do I become a thriving artist? Who can help me? What's my first step? What can I do TODAY? Then, I branch off from those questions with potential answers, thoughts, whatever comes to mind. Sometimes it's just more questions and that's ok too. There is no doing this wrong and it's going to constantly evolve as you learn to do things. A solid, sustainable business needs a plan right? This isn't that boring business-stuff that you would need if you're going to apply for a business loan. It's a place to start. A direction to head. And for me, it's going to keep me moving forward, just like I am right now. I would love to hear from you if you've done any mind mapping or have other ideas that might help others get moving and keep moving toward their dreams as well. I use mind maps and other diagrams from time to time and my favorite tool for doing that is Lucidchart. I highly recommend giving it a try. Thank you for the tip beargrilz. Another artist shared that she loves an i-pad app called "mind node" too. I will check out them out. I like the flexibility of the digital options, but I tend to lean toward the old school way of writing it down and scribbling it out. Something about the physical act that I connect with.